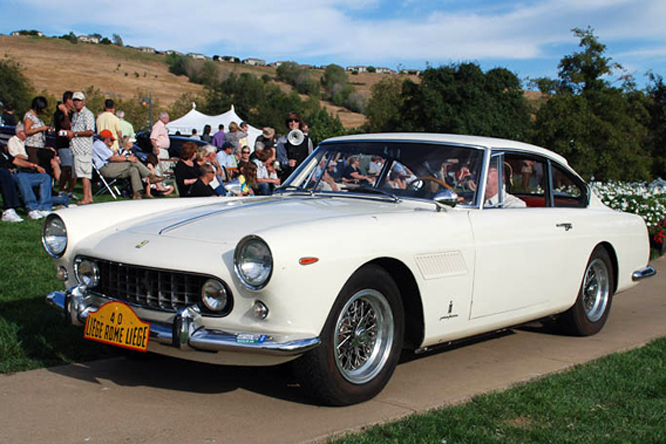 Today’s featured 1962 Series 2 Ferrari 250 GT/E chassis #3509, was supplied to a person or entity known only as Berlet in Italy. 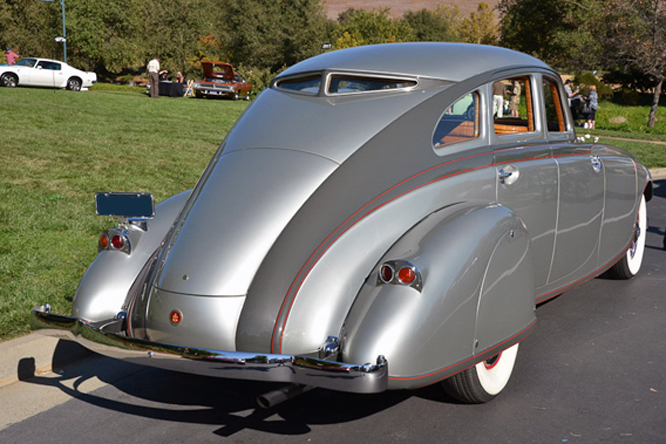 Exactly when current owner Bill Finkbeiner bought the car, or even who from, is not known at this time, if you know any further history about the car please do not hesitate to chime in below. 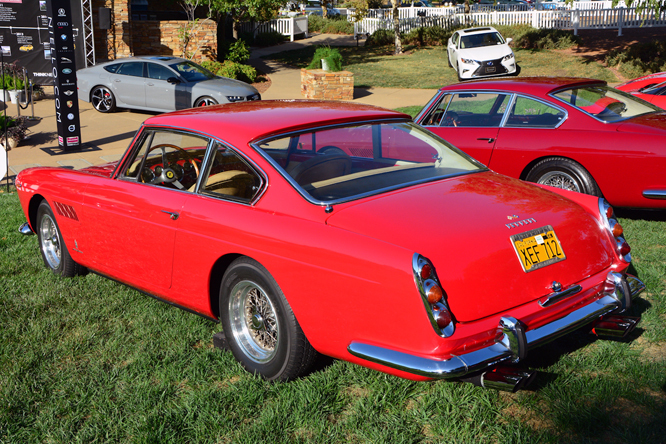 My thanks to Geoffrey Horton for sharing these photographs of #3509 taken at Niello Concours at Serrano last year. Thanks for joining me on this “Unknown History” edition of “Gettin’ a li’l psycho on tyres.” I hope you will join me again tomorrow when I will be looking at a one off Formula 5000 car. Don’t forget to come back now ! This entry was posted in Uncategorized and tagged 250, Berlet, Colmar, Concours, d'Elegance, Ferrari, Finkbeiner, Geoffrey, GTE, Horton, Niello, Psychoontyres, Ralph, Serrano on January 29, 2016 by Ralph. Two years after the introduction of the Porsche 930 street car marketed as the 911 Turbo Porsche manufactured a run of 400 Porsche 934 street cars mandated by a set of rules known as Group 4 in order that it’s customers could compete with a 550 hp race version of the 934 in 1976. In 1977 Porsche built a further 10 white 934/5’s for it’s US customers who raced to the more liberal IMSA GTO series, aside from differences in the front and rear wheels arches and the rear wing which supplemented the tea tray spoiler the 934/5 was fitted with an intercooler which helped cool the combustion charge and raised the output to 600hp at 7000 rpm. 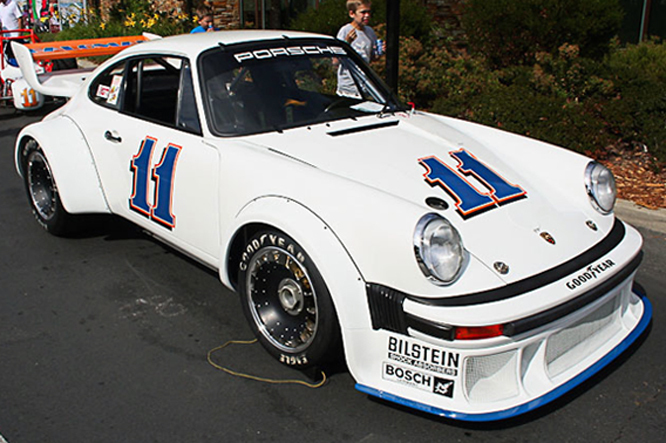 George Dyer took delivery of 934/5 #930 0954 in 1977 to supplement the non turbo charged 911 Carrera RSR which he had been racing since 1973 and co drove to victory in the 1977 Sebring 12 Hours with Brad Frisselle. Records at RacingSportsCars.com show George raced the 934/5, which I believe to be today’s featured car, on nine occasions in 1977 with a win in the 250 mile Paul Revere race at Daytona being the cars stand out success. 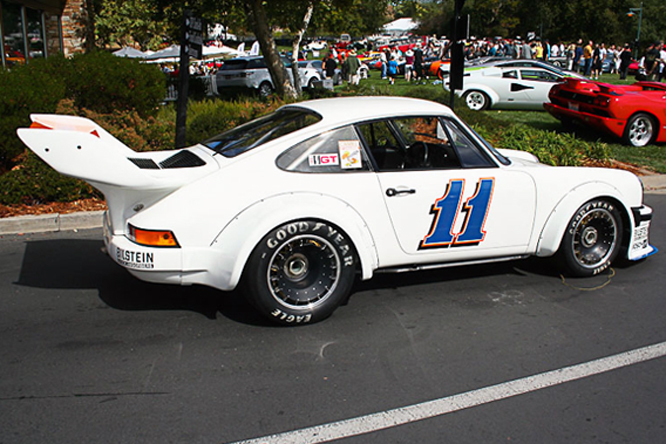 Current owner Bruce Canepa raced #0954 once in 1978 finishing 7th at Sears Point before driving the car with Rick Mears and Monte Shelton to a third place finish in the 1979 Daytona 24 hours which seems to have been the cars final race appearance. 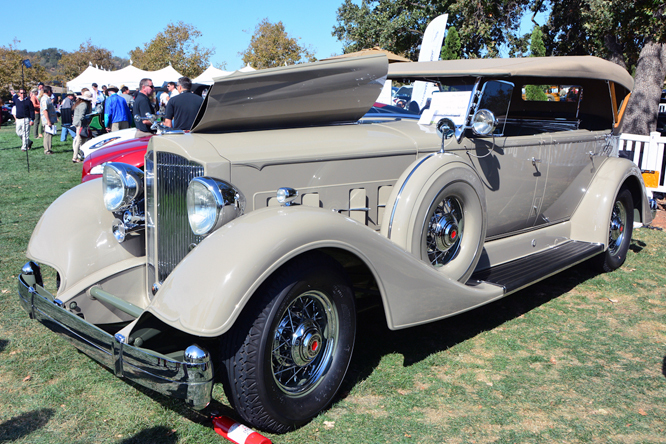 My thanks to Geoffrey Horton for arranging for me to share these photo’s of the car taken by Karl Krause at Niello Serrano Concours d’Elegance a couple of years ago. Thanks for joining me on this “Intercooled IMSA GTO Racer” edition of “Gettin’ a li’l psycho on tyres” I hope you will join me again tomorrow when I’ll be looking at a Jaguar powered special that anticipated the arrival of the E-Type Jaguar. Don’t forget to come back now ! 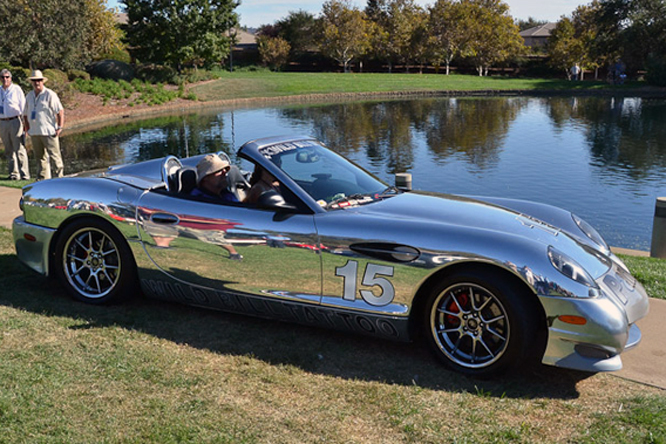 This entry was posted in Uncategorized and tagged 930, 934, 934/5, Canepa, Colmar, Concours, d'Elegance, Dyer, Horton, Intercooler, Krause, Mears, Niello, Porsche, Psychoontyres, Ralph, Serrano, Shelton, Turbo on January 21, 2016 by Ralph. 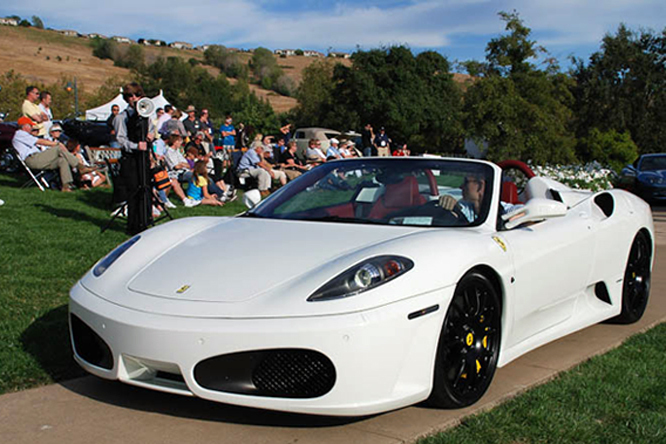 Today’s blogs looks at some of the Ferrari’s at Niello at Serrano Concours d’Elegance, digitally captured by Geoffrey Horton for us. 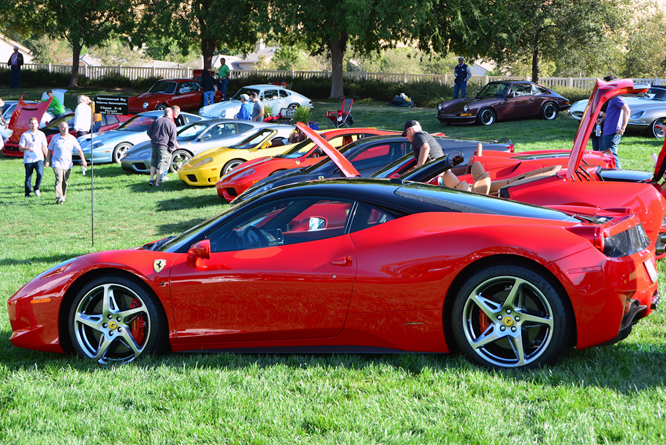 The 458 Italia is as stunning graceful today as it was the day it was launched in 2009. 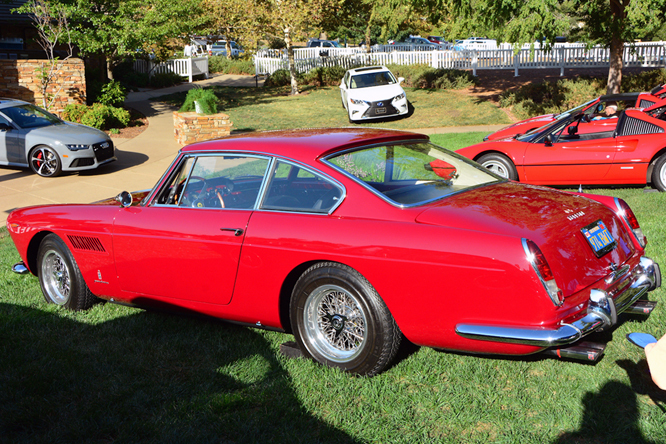 Of the two 1962 Series 2 Ferrari 250 GT/E’s present the older by default was chassis #3509GT above …. 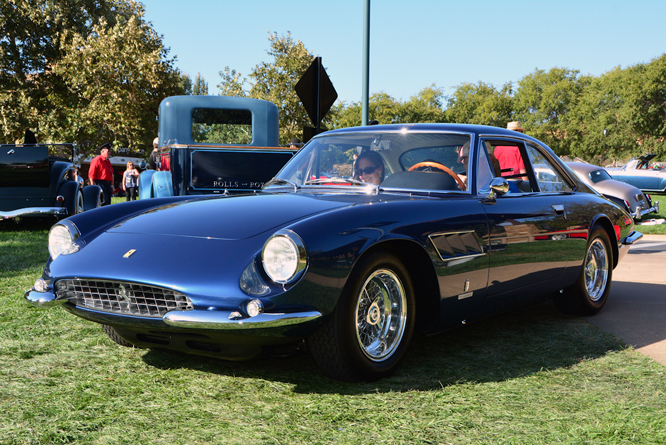 … since the last of the Series Two 250 GT/E’s to be built was chassis #4089 seen above. I doubt one can ever see enough photograph’s of the Ferrari 500 Superfast chassis #8019SF that formerly belonged to hanging Judge Samuel Simon Leibowitz. 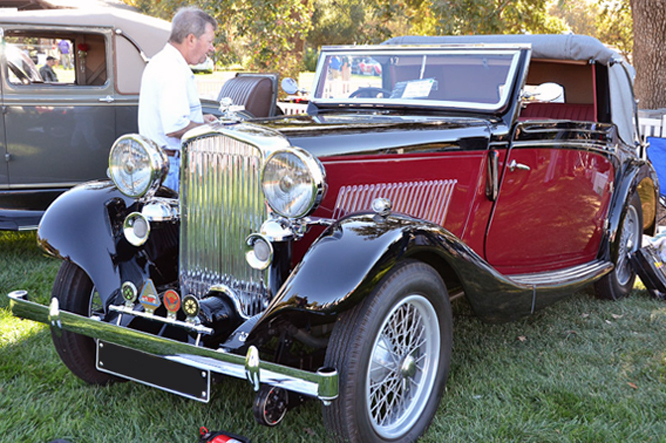 My thanks to Geoffrey Horton for sharing his Concours d’Elegance photographs this season which I hope he will continue to share with us next year. Thanks for joining me on this Ferrari Friday edition of “Gettin’ a li’l psychoontyres” I hope you will join me again tomorrow when I’ll be looking at the complicated story of a Chevron B16. Don’t forget to come back now ! This entry was posted in Uncategorized and tagged 250, 458, 500, At Serrano, Ferrari, Geoffrey, GTE, Horton, Italia, Niello, Superfast on October 30, 2015 by Ralph. In order for Ford’s new 4 seat Mustang to compete in the SCCA’s B Production class Carroll Shelby set about building a series of Shelby Mustang G.T. 350’s to meet the series regulations which stipulated a requirement for a minimum 100 examples of a “2 seat sports car”. 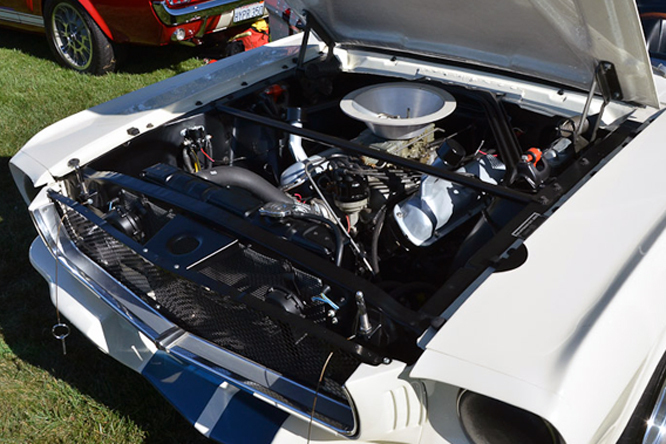 To power the new “sports car” Shelby used the K-Code 271 hp 4.7 litre / 289 cui V8 modified with the aid of the Cobra “hi riser” intake manifold fed by the scoop in the fibre glass bonnet / hood and dual side exhausts, to produce 306 hp. Having opted for limited engine modifications the SCCA permitted more radical race suspension options which in the G.T. 350’s case ran to lowered A arms, heavy duty shock absorbers and upper arms, a heavy duty Ford Galaxie rear axle and “over rider” traction bars fitted above the rear leaf springs. The space where the back seat had been was taken up by a full size spare wheel comprising Goodyear Blue Spot tyre on either a 15″ steel wheel or a 15″ cast magnesium Crager Shelby item. 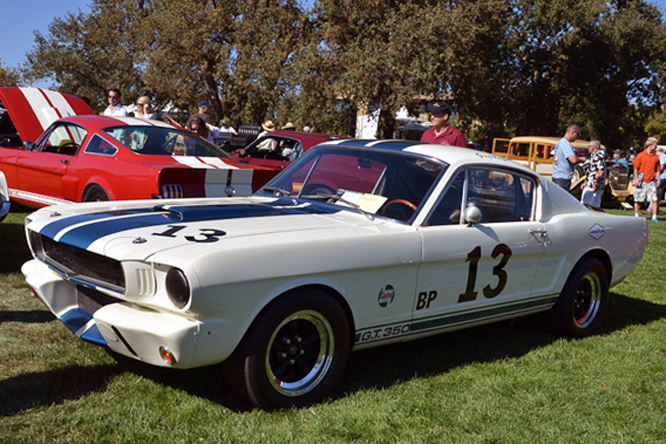 34 G.T.350 R race spec cars were built and between them they captured 3 consecutive B Production class SCCA titles from 1965 to 1967 with Mexican Freddy Van Buren winning the ’67 title along with the 1966 and 1967 Trans Am titles. The rest of the Shelby G.T. 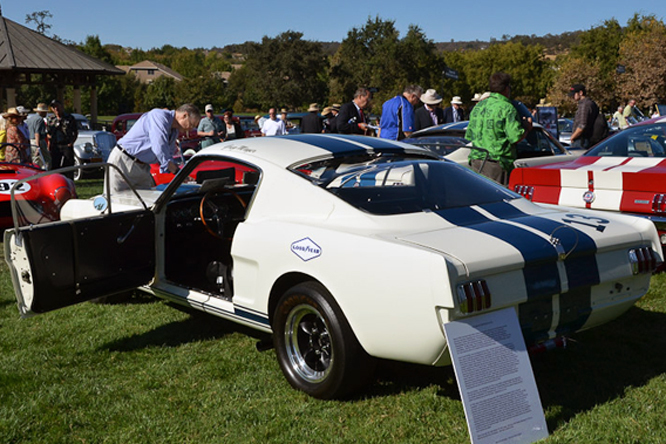 350’s, including today’s featured car were built for road use though the owner of this one confesses that “Driving a 1965 Shelby Mustang G.T.350 is a blast for the first 20 to 30 minuets… after that it starts to hurt”. All 562 Shelby Mustang G.T. 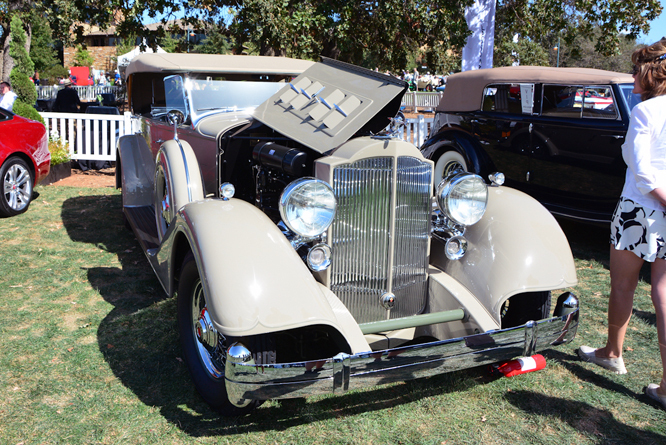 350’s were painted Wimbledon white and had the Guardsman Blue rocker stripes with the G.T. 350 logo, only 28% had the full length Guardsman Blue Le Mans stripes from new, though now nearly all of them do. 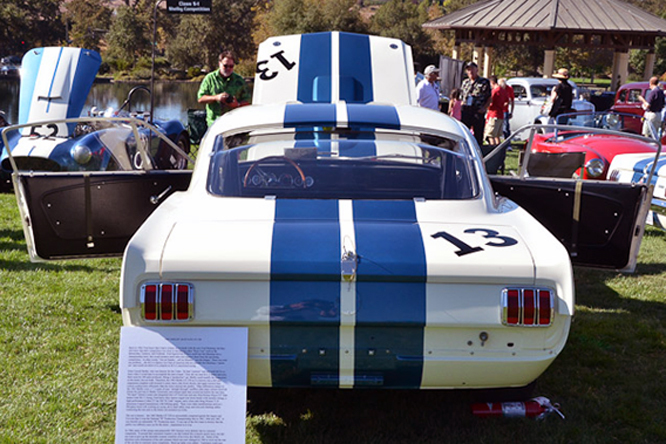 My thanks to Geoffrey Horton for sharing his photographs taken at Niello Concours at Serrano a couple of years ago. I hope you will join me again tomorrow when I’ll be looking at one of my all time favourate FIAT’s. Don’t forget to come back now ! This entry was posted in Uncategorized and tagged At, Cobra, Colmar, Concours, Crager, Ford, Galaxie, Geoffrey, GT350, GT350R, Horton, Mustang, Niello, Psychoontyres, Ralph, Serrano, Shelby, Van Buren on May 21, 2015 by Ralph. 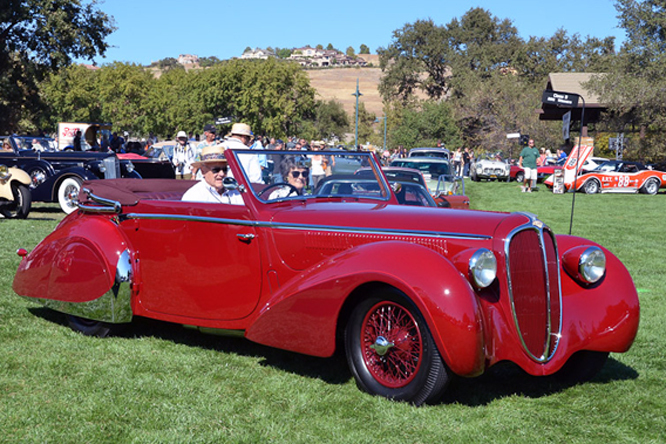 The weekend before last Geoffrey Horton took his Jaguar out of it’s garage for the last time this year to attend the Niello Concours at Serrano. He kindly sent today’s featured photographs for us to enjoy. 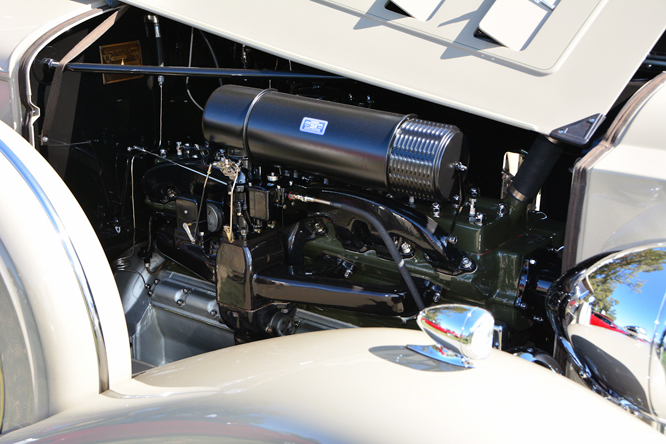 The achievements of Pierce Arrow and Carroll Shelby were being celebrated at Niello, above a 1933 Pierce Silver Arrow one of only three such 115 mph V12’s known to exist. Suffering from slow sales of aero engines made under license from (French) Salmson in 1934 British Salmson extended it’s license deal to include local manufacture of Salmson cars. Above is a 1936 S4C similar to it’s French counterpart except that it has syncromesh on the top two gears of the gearbox. 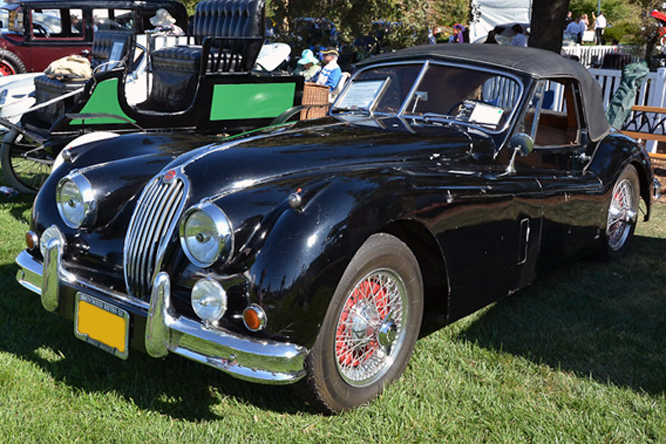 Around 250 S4C’s were manufactured from 1934 to 1938. For a Delahaye the vehicle above is pretty tame, by Delahaye standards, I’m not sure of either the year, model or coachbuilder, looks most likely a 135 which could have been built 1935 and 1954. If you know which more please do not be afraid to chime in below. Not sure what this one is at the time of writing looks a little like a Mk 1 Triumph Spitfire with a lot of additional chrome, the wheels look like they come from a Berkeley. If you know what this one is please chime in below, it’s certainly not in my I-spy book of cars. Carroll Shelby ordered two new Cooper Monaco’s beefed up to carry Shelby’s 289 Ford V8’s for the 1963 URRSC sports car championship. 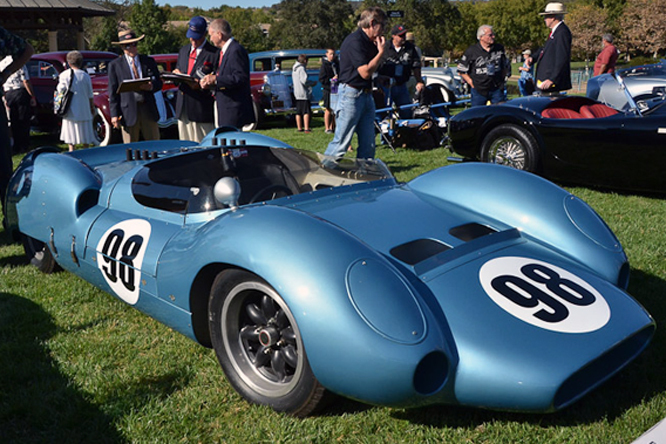 Chassis #CM/1/63 seen here was driven by rapidly rising star Dave MacDonald to victories in both the 1963 Los Angeles Times Grand Prix at Riverside and the Monterey Pacific Grand Prix at Laguna Seca which along which helped MacDonald secure the 1963 URRSC sports car championship. 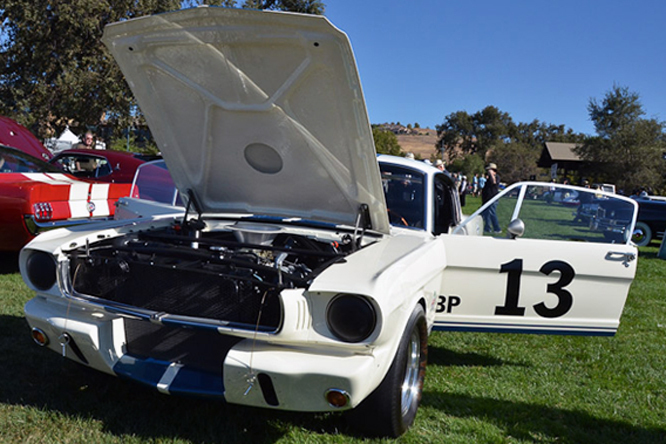 The 1965 Shelby GT 350 was built to compete in the SCCA National B Production Championship with full race suspension larger oil pan and straight through exhaust side pipes. It was fitted with ‘only two’ seats to comply with the SCCA regulations. This particular copy, one of 562 built in 1965, has been in the same family since new. For 1970 the US Department of Transport demanded extra visibility over the bonnet / hood of all cars and so all post 1970 model year Mercedes 280 SE’s received a lower grill than in previous years. 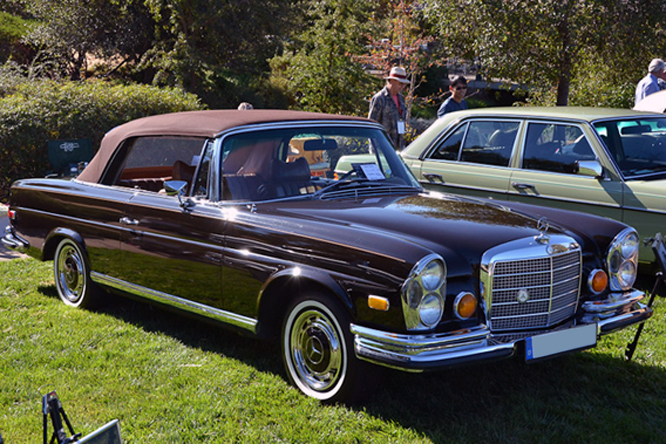 The Low Grill 280 SE Cabriolet above is one of just 237 built in 1970. 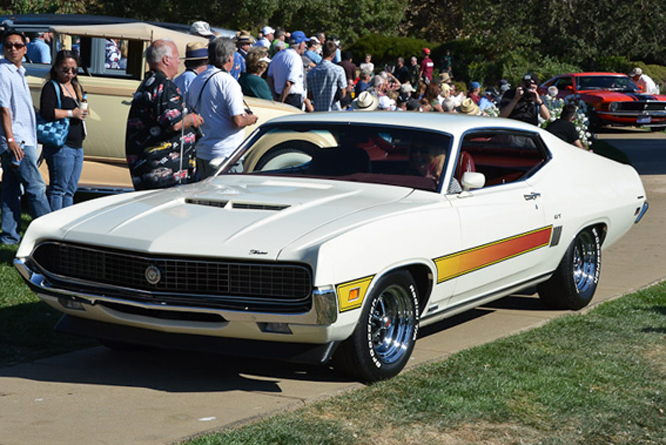 Capable of reaching 60 mph in six seconds and covering the quarter mile in just 14.4 seconds the Ford Torino GT introduced in 1970 could be ordered with sports deck, hideaway head lamps and reflective side stripes, just like the one seen above. 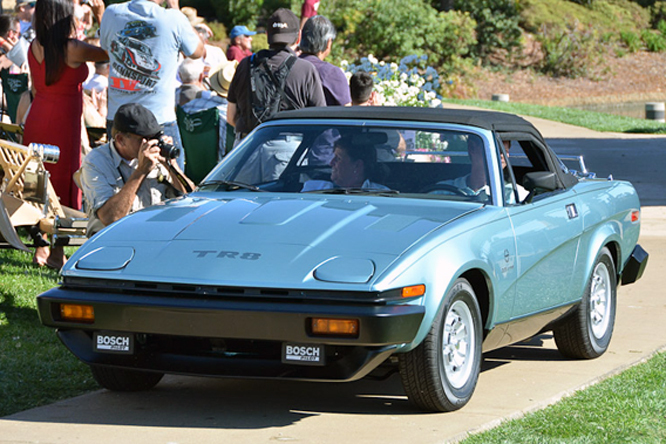 The English Corvette as the Triumph TR8 was known was manufactured 1978 to 1982. This one would appear to be one one of the 2400 dropheads built between 1980 and 1982. The Panoz Esperante can be ordered in GT, GTLM and GTS specs with an after market JRD upgrade available if you need the speed and have the budget to satiate it. The car above is a 2005 model is the first of 80 Supercharged GTLM models. Amongst Wild Bills other vehicles are an amphibious Amphicar and Messerschmitt Kabinen Roller ! And so it’s time to thank Geoffrey one the last time this year for his fabulous Concours d’Elegance contributions to GALPOT this year, there will of course be further contributions about individual vehicles, and hope that his Jaguar stays safe over the off season in anticipation of the 2013 California Concours d’Elegance season. Thanks for joining me on this “Shelby Pierce Arrow” edition of “Gettin’ a li’l psycho on tyres” I hope you will join me again tomorrow. Don’t forget to come back now ! PS Since writing this Geoffrey has informed me that the unidentified car that looks like a cross between a Triumph and a Berkeley is a 1956 FIAT 1200 TV Spider. We live and we learn ! Thanks again to Geoffrey. 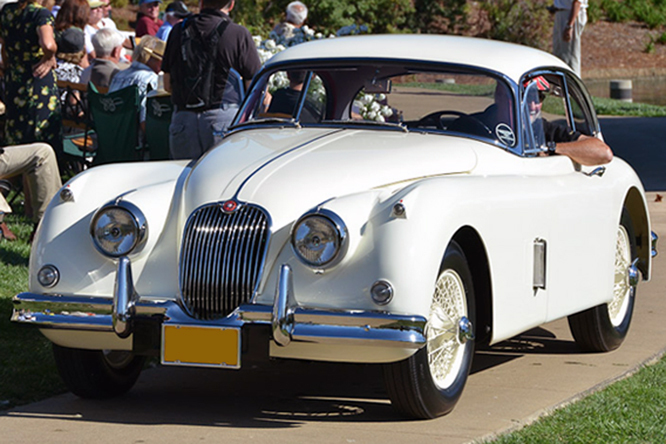 This entry was posted in Uncategorized and tagged Arrow, Benz, British, Colmar, Conocurs, d'Elegance, Delahaye, Fiat, Ford, GALPOT, Geoffrey, Horton, Jaguar, Mercedes, Niello, Panoz, Pierce, Ralph, Salmson, Serrano, Shelby, Triumph on October 15, 2012 by Ralph. 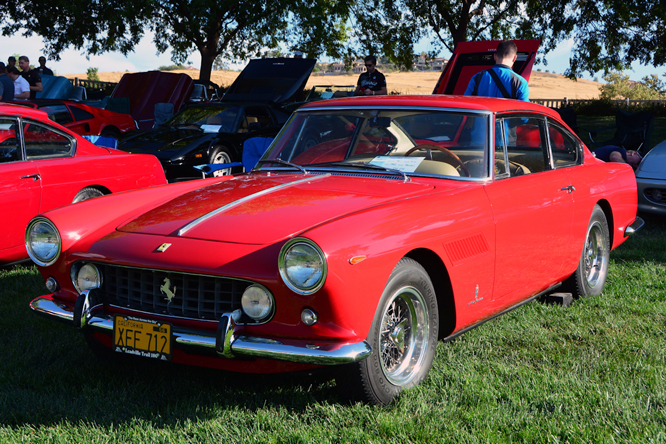 For Ferrari Friday GALPOT continues yesterdays perusal of vehicles on display at the Niello Serrano Concours thanks to Geoffrey Hortons photographs. First up a Ferrari 250 GT/E 2+2, one these models was Enzo Ferrari’s daily driver, early GALPOT readers may remember such a vehicle appearing in a previous blog, albeit modified into a replica 250 GT SWB Competizione. 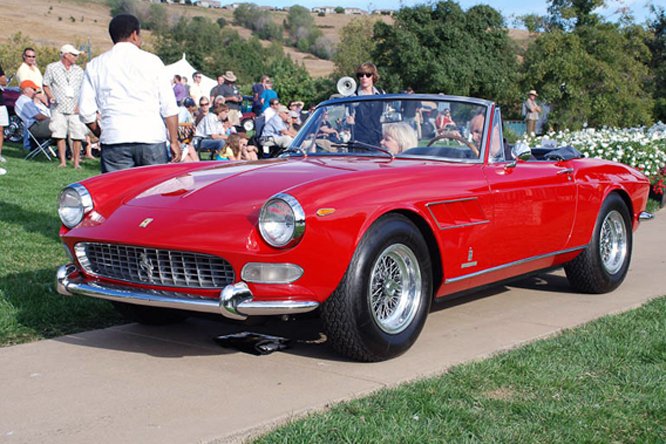 More exclusive, one of just 200 models built between 1965 and 1968, is this Ferrari 275 GTS powered by a 3.3 litre / 201 cui V12. 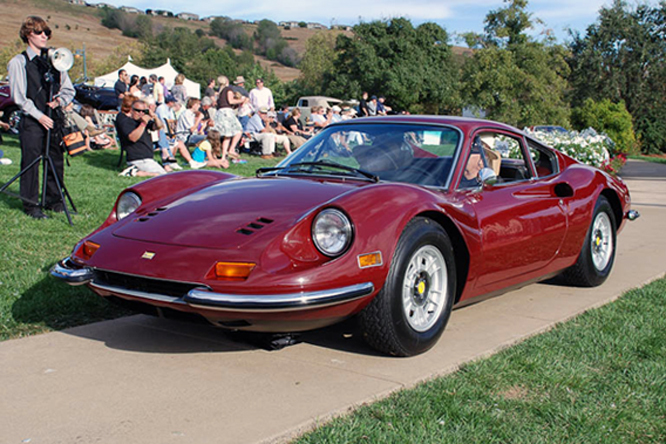 The V6 Ferrari Dino had been in production for two years and two distinct series from 1969 to 1971 before the first Series III Dino’s were manufactured for the US market, this is one of 1,431 Series III Dinos produced between 1971 and 1974. 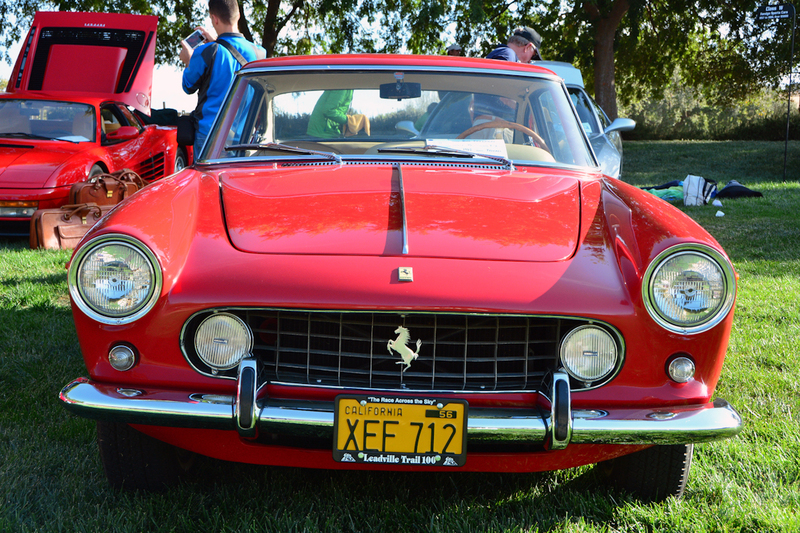 Manufactured between 1971 and 1972 the Ferrari 365 GTC/4 is a 2+2. 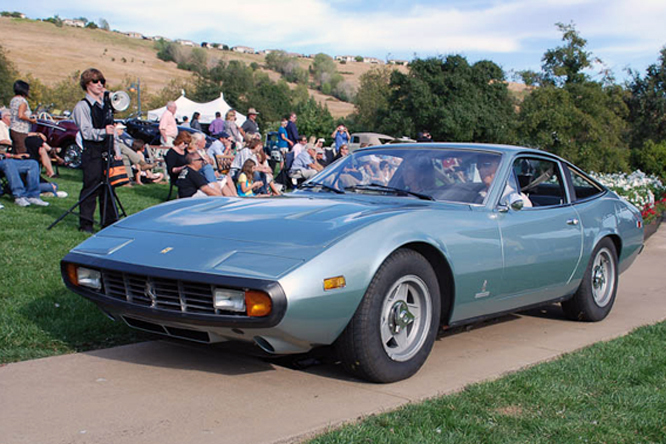 One of the 500 examples produced appeared in the 1977 film Herbie Goes To Monte Carlo alongside several other Ferraris including a slightly more powerful 365 GTB/4 Daytona with which the GTC/4 shares a common chassis. 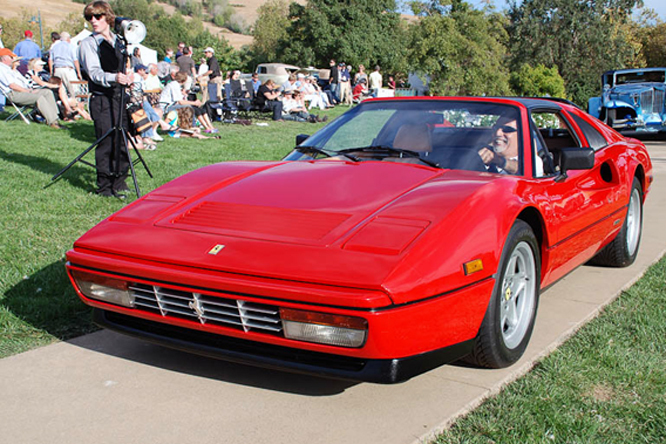 Representing Maranello’s prancing black horse for the 1980’s at Niello Serrano was this Ferrari 328 GTS of which some 7400 were manufactured between 1985 and 1989. 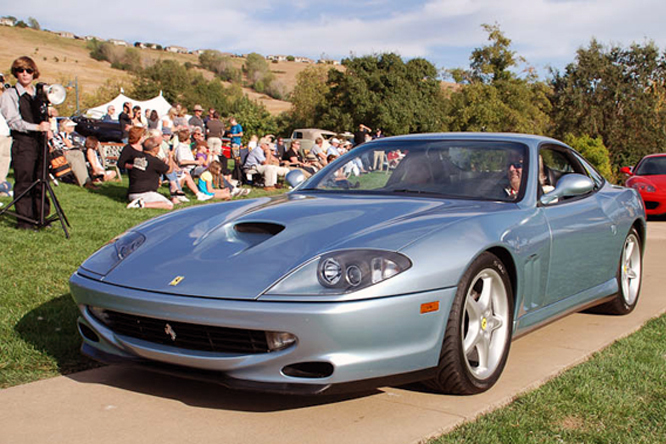 Ferrari returned to manufacturing motor cars with the engine in front of the driver in 1996 with the beefy 550. With a boot / trunk large enough to carry a set of golf clubs the Ferrari 550 was turned into a handy racer at Le Mans by the likes of Prodrive. 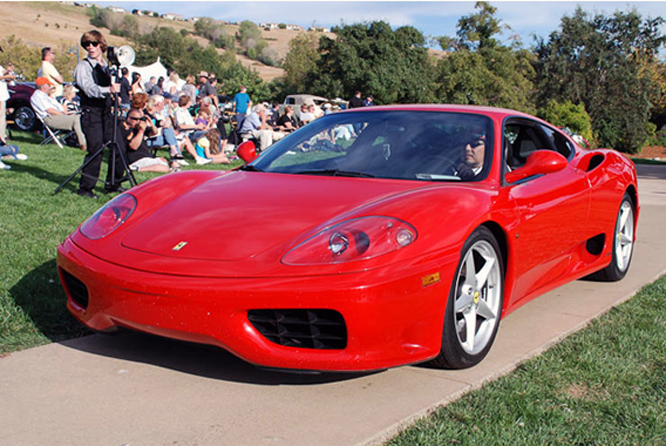 Twentieth model in Ferraris catalogue of street legal exotics is the Ferrari 360 a model produced from 1999 – 2005 which you may remember from an earlier blog was made available with an optional Tubi Style exhaust to provide extra horsepower and amplify the sound. With a 200 mph top speed the Ferrari F430 that replaced the 360 in 2004 arguably had no need of gimmicks like optional Tubi Style exhausts. It looks good, sounds good and goes fast, pretty much everything one could want from a Ferrari except of course it’s replacement the F458 Italia. 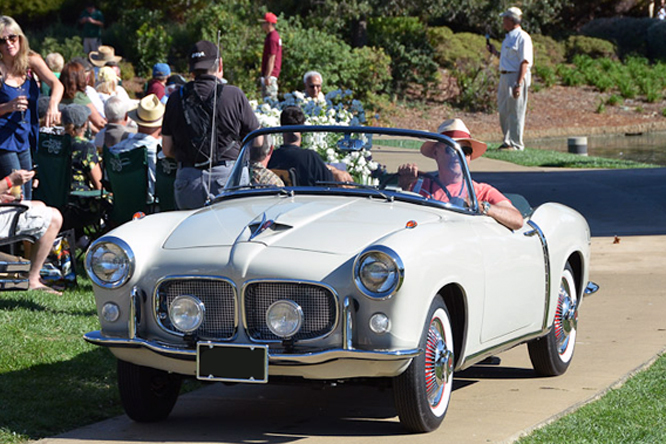 My thanks to Geoffrey Horton for sharing the delights of the California Concours season with us at GALPOT, I look forward to seeing what motoring delights he will find next year. Thanks for joining me for Ferrari Friday, I hope you will join me again tomorrow when I’ll be looking at an innovative Lotus with a body designed by Peter Kirwan-Taylor. Don’t forget to come back now ! This entry was posted in Uncategorized and tagged 250, 275, 328, 360, 365, 550, Art, Concours, Dino, F430, Ferrari, GALPOT, Geoffrey, Horton, Niello, Serrano, Tidesco on October 14, 2011 by Ralph.